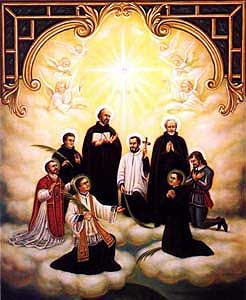 Today is the feast of the North American martyrs. These were eight Jesuits who were killed by the Iroquois between 1642 and 1649, most of them being martyred between March and December of 1649. The names of these illustrious martys are (in the order of their martyrdom), St. Rene Goupil (d. 1642), St. Isaac Jogues ( d. 1646), St. John de Lalande (d. 1646), St. Anthony Daniel (d. 1648), St. John de Brebeuf (d. 1649), St. Gabriel Lalemant (d. 1649), St. Charles Garnier (d. 1649) and St. Noel Chabanel (d. 1649). The North American martyrs belong to a long distant time, a time when the hostility of the native population or the prospects of success (or likelihood of death) did not deter the evangelical efforts fo the Church but rather intensified them. The Jesuit martyrs are remembered as martyrs of the Iroquois, but it was to the Hurons along the St. Lawrence that they were laboring for souls. Many, if not most, of these Hurons had accepted the faith and were leaving in peaceful communion with the Jesuits. It was the Jesuits' support of the Huron, long time enemies of the Five Nations, that earned them the contempt of the Iroquois and led to their eventual martyrdom. I think the North American martyrs serve as an example to us today, especially in looking at the evangelization of the Muslim countries. If there ever was a land that seemed completely inhospitable to Catholic evangelism, surely it was the wilds of New York, then belonging to the Iroquois empire, who were equal to the Aztecs in the warlike nature and hostility. Nevertheless, the attempt was made at evangelization, and much progress was made among the Hurons before the Jesuits met their bloody end. Muslims have been called "unconvertable." Looking at the example of these martyrs, ought that to prevent us from trying? Suppose every missionary who entered a Muslim country was to be beheaded immediately upon arrival; I say we should still be sending them there in droves. What Tertullian said famously about the blood of the martyrs being the seed of the Church is no less true now than it was in the 2nd century. Who cares if the Muslims don't want us there? When did that ever stop Catholic missionary efforts? The Iroquois did not want us there either; nor the Aztecs, nor the Frisians, nor the Roman imperial bureauacracy. Whether or not the native populace desires our missionaries simply isn't an issue. The problem these days is the Church seems to think it should only undertake missionary activity where it is welcome by the population. If that is our criteria, we might as well just pack up and go home! May God send us scores of zealous religious who are as eager to lose their heads in Muslim countries as Muslims are eager to blow themselves up in ours! St. Isaac Jogues and companions, ora pro nobis! Click here for a lenthy biography on the eight North American martyrs. Muslims are not impossible to convert. In fact, during the past several decades, many thousands in different parts of the Muslim world are becoming Christians. Whole families and villages are converting. Some are being converted by dreams and visions of a Christ-like figure. And there are many missionaries among them: mostly lay and non-Catholic who are living in a secular occupation in order to witness. I have very close friends among them. While it certainly remains risky for all involved, it isn't quite like the North American Martyrs. Most of this intentional activity is evangelical, rather than Catholic. So much depends upon where in the Muslim world you live. I met a Catholic priest in Indonesia who was a former Muslim. I had a former Muslim on our teaching team there. They were living openly in the society and no one talked about them in whispers the way that say, you would, in Saudi Arabia. I would not say Muslims are unconvertable, either, though they prove resilient to missionary efforts. But my point is that not many serious missionary efforts have been made to them in the past few cneturies.